Whether you use your bike to commute, run errands or take longer trips, you'll need a way to carry essentials, from a small repair kit to full-on camping gear. A daypack or messenger bag is good for shorter trips, but some of your best gear-carrying options are racks, baskets, and bags that fit on your bike. A rack provides a stable framework to hold the gear on your bicycle. It has a built in fender board that doubles as a splash-guard during wet conditions. In good weather, items can be strapped directly to the rack without a cover. For foul weather or the ability to hold loose items together, bags such as rack trunks and panniers can be easily attached to the rear rack. 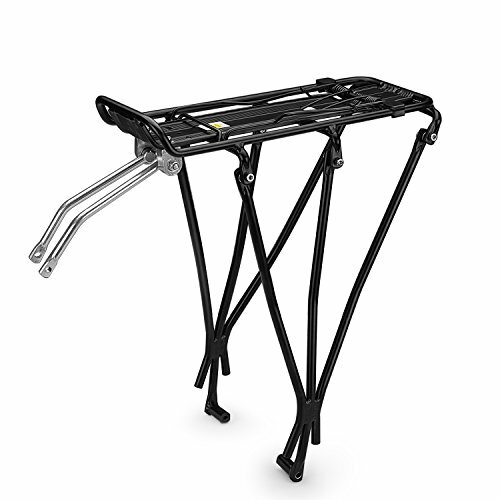 Our rear rack rated to carry loads 55 LBS, which is sufficient for most uses. This rack is strength, affordable, and fits on most of the bikes.